Just after the second major earthquake hit Nepal, I was part of a Médecins Sans Frontières team conducting a needs assessment in several villages of Dolkha District. Dolkha was already hit hard by the first earthquake, and with the second one, it is difficult to describe the devastation and loss of life. We visited a dozen or more villages, travelling by helicopter as the roads are impassable. We provided basic medical care and emergency evacuation of the injured requiring hospital treatment. Time and again we heard the same stories of flattened houses and schools, loss of life, lack of food and shelter, palpable fear for the future from falling rocks and landslides, and the desire to move somewhere safer. Yet woven into these stories was stoicism, dignified innocence, kindness and generosity in the face of immense challenges. We landed in several small villages where we had heard that people were in need of immediate medical care, including Charikote, Singati Bazar, Jhyaku, Laplang, Jagu, Ksetrapa, Marbu and Yangalakote. From the air, we could see innumerable landslides that had destroyed roads and cut off villages from much needed relief materials. The beauty of this rugged terrain that attracts so many tourists has become a curse in this time of disaster and need. Flying over the hills and mountains gives a broader perspective of the destruction down below but it is not until you land that you understand the huge suffering of the people living in these villages. Way up the hill, cut off completely, lies the village of Marbu. The village is surrounded by deep gorges and high cliffs that are scarred by the landslides. We heard the rumbling of falling rocks and shifting dirt and saw the cloud of dust triggered by aftershocks. Never before had a helicopter landed in Marbu – naturally people were curious and surrounded us as we asked about the sick and injured. At the back of the crowd I saw a boy with a bandaged head. The bandage was encrusted with dry blood and yellowish exudate, the top of his skull was depressed and his eyes swollen. He said his name was Raj but he barely responded and was hot to touch – the thermometer read 40.1 degrees centigrade. My heart sank in fear for his life and I worried about the lasting damage from what appeared to be a severe head trauma and resultant infection. I quickly inserted an intravenous line and gave him some fluid and antibiotics. It is sheer chance that we landed in this remote village just in time to assist this beautiful 10-year-old boy, wearing an ‘I love Nepal’ t-shirt, within 24-hours of this second quake. He was airlifted to Kathmandu without delay while another doctor friend and I continued to treat other people with minor injuries. A few days later I am back in Kathmandu, but my heart continues to wander in the mountain villages and the valleys below. I see the innocent faces of children and the weather-worn wrinkles of the elderly. I hope young Raj is okay. After a little searching and a few phone calls, I finally find him. 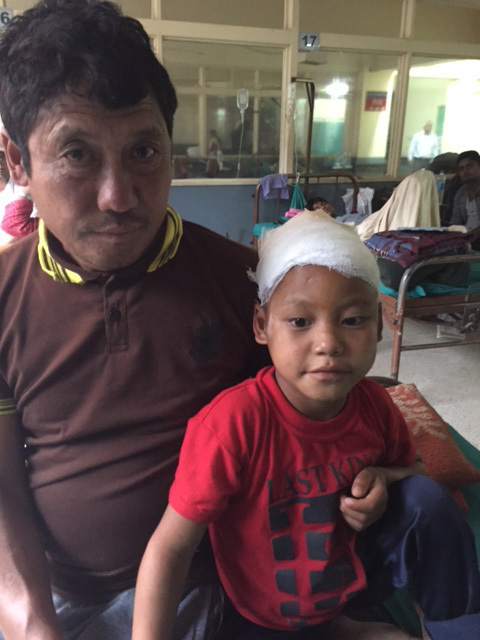 Raj is in a surgical ward in Teaching Hospital, Kathmandu! He was fast asleep when I visited but just to see him at rest and peaceful without distress was more than I could ever ask for! His father said he is recovering well after surgery. When he is discharged, Médecins Sans Frontières will fly him and his father back to his village by helicopter. Although Raj suffered a terrible injury, he is one of the lucky ones. More than 7,000 people have been killed by the earthquakes – people’s mothers, fathers, children. There are so many stories to listen to and many stories to tell.